Like every girl, I want to feel beautiful. The problem I have had with my weight loss journey, however, is that it sometimes feel impossible to find clothes that not only look nice on me, but make me feel confident. Some of the stuff you find in stores is almost insulting, like women who are a bit on the heavy side don’t want to look fashionable or beautiful. Yes, I’m overweight, yes, I’m trying to do something about it, but I am not about to wear big giant flowers. There is a reason those clothes got on the clearance rack! Worse, they feel absolutely terrible. I want clothes that make me feel beautiful, confident, and are made to last. Recently, I found what very well may be the perfect collection for me, made from eco-friendly fabric – Cariloha’s own clothing line. With how much my husband loves his bamboo clothes, I couldn’t wait to try out my Cariloha Bamboo V-Neck Tee when it arrived in the mail! Cariloha Bamboo V-Neck Tee: What is It? Looking for the softest, best looking shirts around? 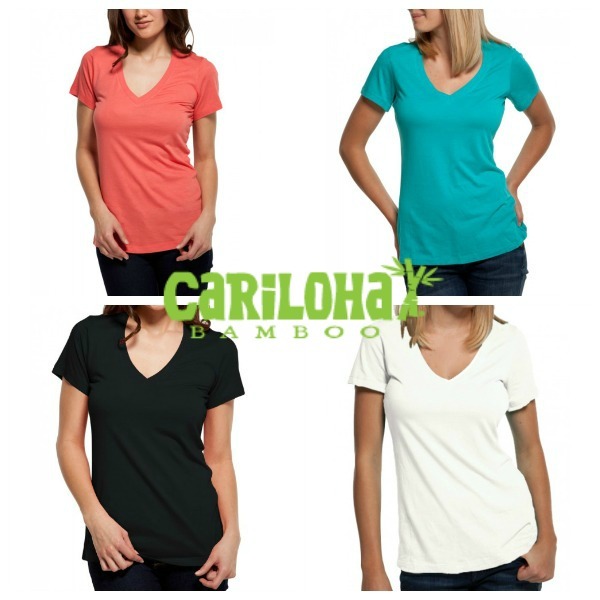 If so, we think you will love Cariloha Bamboo V-Neck Tees! These cute t-shirts are not only super soft, but durable, giving you a quality shirt that is made to last. Unlike other shirts, these machine washable shirts are made from hypoallergenic bamboo fabric, which has been proven to be 3 degrees cooler than cotton and wicks moisture away from the body, keeping you more comfortable throughout the day! As well, it is designed for women of all body types, being available in XS to 2XL in 6 great colors! So far, I have to say that I love this v-neck t-shirt. Not only is it super soft, but feels very cool and comfortable, perfect for people who hate being hot like me. Best of all, it feels very flattering on me, making me feel very confident as I am going through my journey to lose weight. As anyone will tell you, confidence is a large factor in losing weight since it makes sure you keep going! With the awesome feel of this shirt and how great it looks on me, I can’t wait to buy t-shirts from Cariloha. Based on my own experience, I am happy to give Cariloha Bamboo V-Neck Tees an A rating! Want to try this awesome shirt for yourself? You can find the Cariloha Bamboo V-Neck Tee at the Cariloha website. As well, don’t forget that they have a full line of bamboo men’s and women’s clothing for every season! I have to pick one of these up. I keep hearing about how soft bamboo is. And, I love plain clothing (no writing or prints) Solid colors are much easier to match and wear with other clothing. I love bamboo towels, I know I would love the shirts. Thank you for sharing. Its awesome the fashion of the all v neck t shirts. That’s all looks amazing. I would love to have a couple of these and a sheet set, towels and a bamboo robe. It all looks so soft and comfortable. I live in t-shirts all summer long. They’re comfortable and light weight. I still haven’t tried bamboo yet.